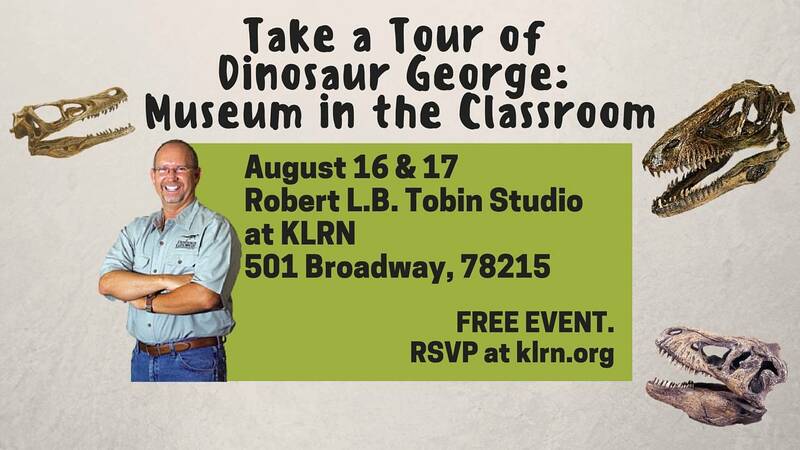 Dinosaur George: Museum in the Classroom will be held Tuesday, Aug. 16 and Wednesday, Aug. 17 at Robert L.B. Tobin Studio at KLRN, 501 Broadway, San Antonio, TX. Dinosaur George's Museum in the Classroom is a self-guided exhibit that you can experience at your own pace. Program staff and museum ambassadors can answer questions and enhance the journey back in time. George Blasing is a self-taught paleontologist and animal behaviorist with more than 35 years of study and research. Blasing is a public speaker, author, television host and writer who has performed live to over three million people and has lectured in over 3,000 museums, schools and public events. “We are very excited to welcome our community to KLRN for this museum experience. Students, families and their teachers can learn more about prehistoric life and the educational resources that were developed to support the traveling exhibit,” said Maricella Borroel, Director of Education at KLRN. TIMES: 10 a.m. - 12 p.m.; 2 - 4 p.m.; and 5 - 7 p.m.
KLRN is the Emmy-Award winning Public Television station for South Central Texas, broadcasting to a 30-county radius. “The mission of KLRN is to use the power of communications to provide quality programs and services which advance education, culture and community, to enrich the lives of people throughout our community.” KLRN cultivates programs that support the station’s mission and commitment to education. It is this “beyond television” strategy that forms KLRN’s educational outreach model — to prepare children for kindergarten and academic success; to positively impact the quality of care; and to share resources that will enhance classroom instruction.